Hey All and Happy Monday to you! 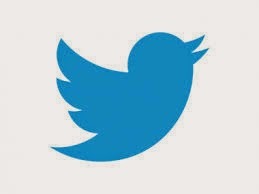 Did you miss me? I was on vacation with my wonderful husband last week and we had a blast together! At the beginning of the week we relaxed and had fun going downtown for St Patricks Day (it's a tradition :) with our good friends. The later part of the week we were "roughing it" in our wonderful cabin buried in the Great Smoky Mountains watching as much basketball as humanly possible. This trip is also another tradition of Hub and I's. Ever since our first year together we have gone down to Gatlinburg for a few nights to get away from it all...and shop!! If you didn't know, there is an amazing outlet mall in Sevierville, which is just outside of the G Burg. We save up all year because we know all the stores will be having their annual spring sales. We saved over $500 and walked away with a TON of stuff! It's so nice to have my Hubby and our puppy all to myself even if it's only for a few nights. This year was awesome because we were so high up in the mountains we didn't even have cell phone service! I swear I felt closer to Jesus up there :) Peace, quiet, food and basketball. Pretty awesome. With staying in a cabin, there are a few things you don't have access to like in your normal kitchen, so you have the joy of improvising. In my case, I needed something to secure my bacon to my filet before it went on the grill (like I said..."roughing it"). After searching everywhere, all I could find were matches. 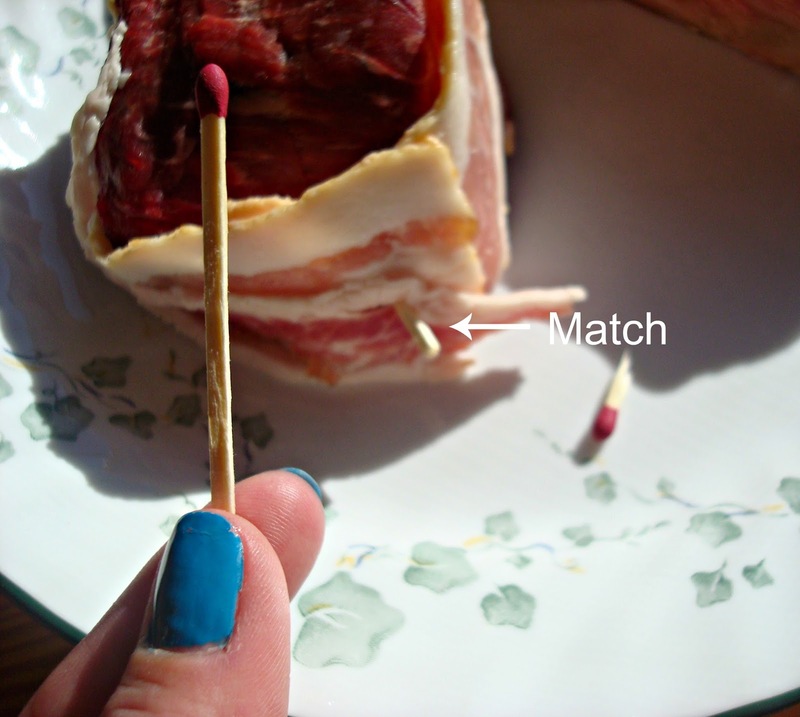 So I popped the head off the match and stuck a few in the steak. Worked like a charm! Another joy of vacation was I ate whatever I wanted! I'm talking ordering cheese fries every time we went out to eat, having a hamburger AND hot dogs instead of just one...oh...and eating almost the entire box of these babies. I'm not kidding when I say I maybe eat ten doughnuts all year. Even when I make my own doughnuts, I try to limit myself. But I had the vacation bug and there was nothing stopping me from inhaling almost this whole box!! Lucky for me the cabin had a huge wide open loft, so I did get a Zumba workout in every morning. I had to so I could make room for more food! It was truly an amazing week. Before and while I was on vacation, I'd been on this hard boiled egg kick. I don't know what it is, but lately I just can't get enough of them. And it just so happens one of my sisters has the best Deviled Egg recipe any of us have ever known. I mean I have never liked any other deviled egg besides hers, because no others can compare. Well while making a recent batch of hard boiled eggs, I decided I wanted to try out her recipe. I called her up with my pen and pad of paper all ready to go, thinking it's some crazy complex recipe that is going to take me years to perfect. Umm, no. It is seriously so easy. And get this, there aren't any measurements. I swear! I've made these three times now in the past three weeks and they've turned out amazing each time. I'll explain. So first you boil your eggs, then you peel em and cut em in half. Drop the yolks into a small bowl. They should just slide out of the egg. Crush up the yolks with a fork and lightly sprinkle sugar from one end of the bowl to the other. If using a half dozen eggs, add a dime size amount of yellow mustard (or more or less depending on how much you like mustard) and about three times the amount of mustard with mayo into the bowl. Top with a pinch of salt and stir it all together. Scoop back into the eggs and stick in the fridge for about an hour. If you can't wait the hour, go ahead and dive right in. They'll still taste amazing. That's it! Now to make my cute little Deviled Chicks I cut a small amount off the bottom where the yolk isn't to help them stand up. Then I took a sharp knife and cut a zig zag pattern into the top round part, stopping when I felt the knife hit the yolk. Once I made it all the way around, it came off easily. Then I cut out the yolk and deviled them with the recipe from above. I scooped some yolk mix back into the shell and topped with the round part I had cut off earlier. Aren't they adorable!?!? I swear they all have different personalities! I'm going to list measurements just in case you really need numbers to help you out, but this recipe is supposed to be made based on what tastes good to you. So don't be afraid to just wing it! Get it? Wing...like a chicken? No? Ok.
First, hard boil your eggs. Set your eggs in a medium pot and cover with water. Add a pinch of salt, cover with a lid and set on high heat. As soon as the water starts to boil, transfer the eggs to a cold burner, but keep the lid on. Let sit in the pot for 15 minutes. Remove and transfer to a cold bowl of water. Set in the fridge for about a half hour. Take out the eggs and peel off the shell. Slice a small piece off the bottom of the larger end of the egg so that the egg can stand up on it's own, making sure not to cut into the yolk. Using a sharp small knife, cut a zigzag pattern around the skinnier part of the egg, cutting in only until you feel the yolk, and remove the top. Cut out and place the yolks in a small bowl. Smash the yolks down with a fork. Lightly sprinkle a thin layer of sugar across the top of the yolks. Add in the mayo, mustard and salt and stir together. Spoon the yolk back into the eggs and add two small pieces of whole pepper for the eyes and a small piece of cheese for the beak. Then top with the smaller part of the egg you cut off earlier. I like to thin mine out by cutting out some of the white part in the top. It helps the tops stay on better. Refrigerate for about an hour. Serve and enjoy! These will be perfect for Easter! I can't believe it's almost April and we're still forecasted for snow! Anyone going anywhere fun for Spring Break? Got any awesome annual trips you go on? Love to hear about them! Thanks for joining Tasty Tuesday! These are adorable and perfect for Easter! Love this tasty tuesday recipe - and the chicks! 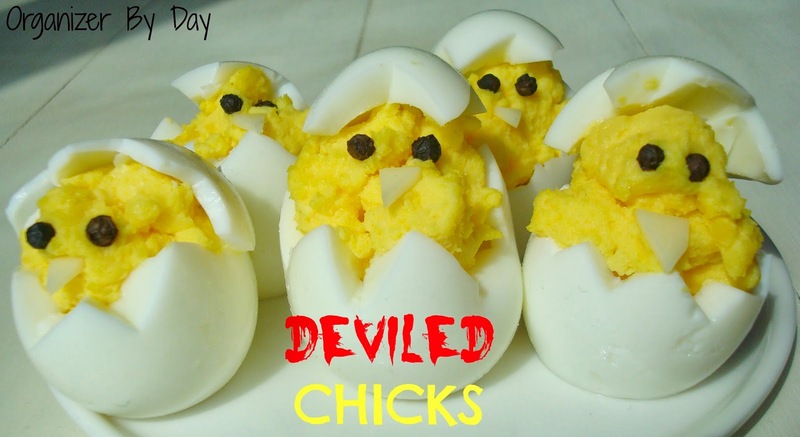 That is very cute AND it puts a unique spin on deviled eggs by making them look like chicks! I must try this out!! Found you through Turn Up Tuesay!! It sounds like you had a great vacation! What a great tradition that you've both started! And I absolutely love your deviled eggs - I don't even like deviled eggs, but I definitely want to try yours! What a cute idea! 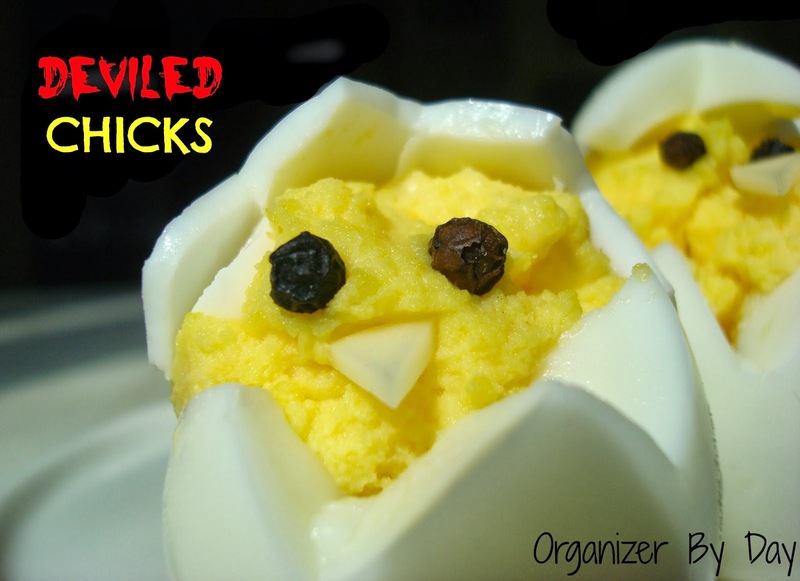 My family LOVES deviled eggs, so we'll definitely have to try this. 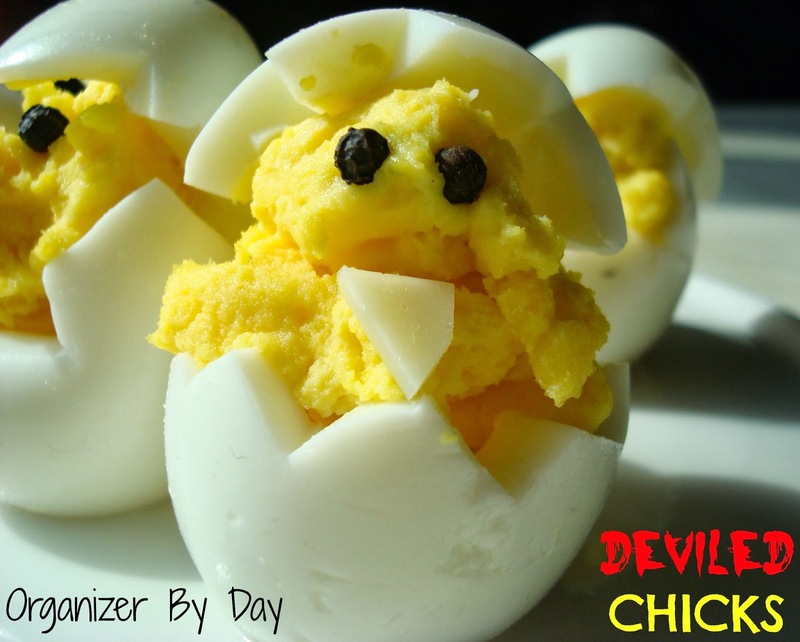 These deviled egg chicks are seriously cute. I'm looking forward to trying these out for Easter - my kids will love them! 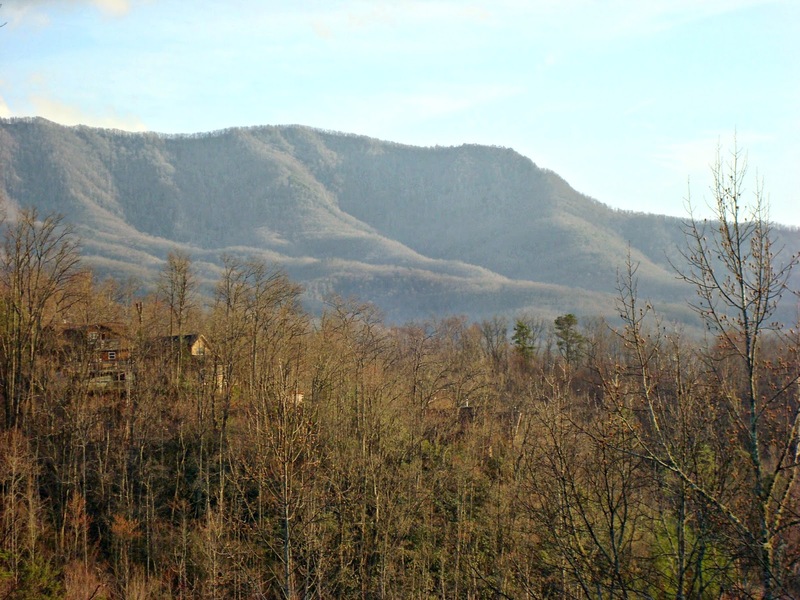 We love visiting Gatlinburg too! 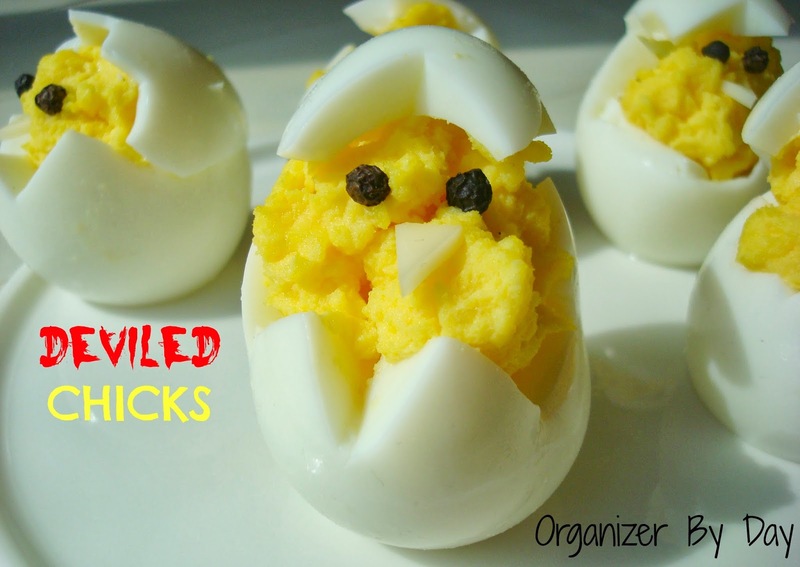 These eggs do not look " deviled egg" they look to cute for the name. Maybe a cute angel eggs. So cute! Good idea! I can't get over how cute they are!! Cute chicks :)! Saw your recipe at the Simple Supper Tuesday party :). Sounds like your vacation was a winner! I love how you improvised! Good for you. 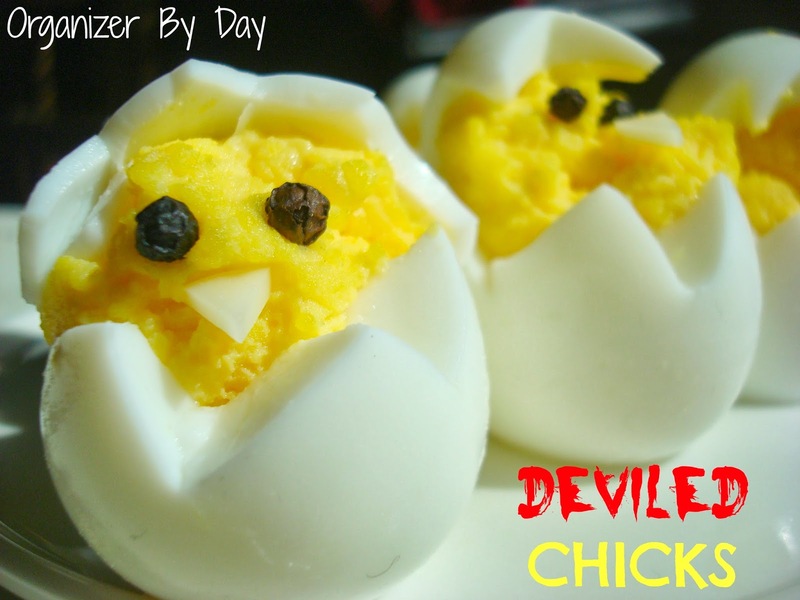 I also like your deviled chicks! what a kick!!! What a great vacation! Those chicks are super cute too. Thanks for sharing at Simple Supper Tuesday. Your chicks are adorable! My little boy will get a kick out of these. 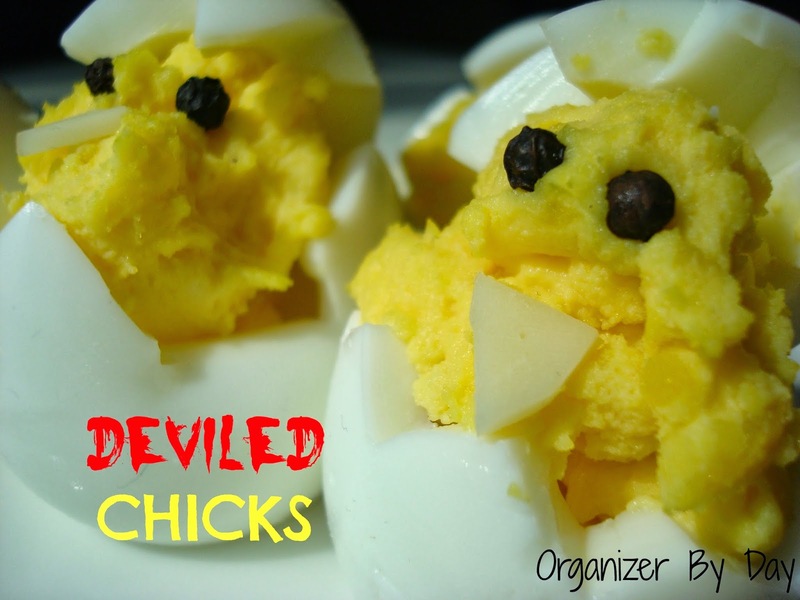 I have been on a egg salad thing lately, so I know what your talking about loving your devil eggs. Found your blog via Worthwhile Wednesdays. Those chicks are a total hoot! Love your sense of humor, too! Have a great day! Okay...these are soo cute!! What a great idea. love them...have a great week:) found you at cast party wed. These are absolutely adorable and MUST adorn my Easter table this year! So glad I saw them over at the From Dream to Reality Party. Thanks for the inspiration and the Pin! Thank you for sharing on our Four Seasons Blog Hop. Pinning Now. So cute! Will have to try this at Easter, thanks for sharing! Visiting from the Foodies & Crafties Soirée. I have to pin this - too too cute for words - how perfect would these be for a baby shower? These are just adorable Eggs and just in time for the Easter season. Hope you are having a great week and thank you so much for sharing with Full Plate Thursday. Found you on Foodie Friday- what an adorable idea!!! These look precious, and delicious! What an adorable idea! I love these! 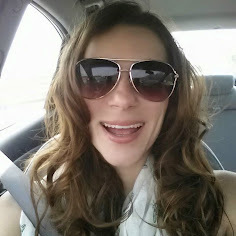 Just pinned :) Thanks so much for linking up at Thursday STYLE! The recipe sounds yummy and the little chicks are adorable! Pinned then to the party board! Super cute and very clever!! Love it! These are too cute and festive. Thanks for sharing at Best of the Weekend! !